The Mobot Knight III is known to be one of the fanciest and sophisticated e-scooters in the personal mobility device market. It is engineered with robust motor power and battery capacity and, at the same time, being stylishly outstanding and sturdy. Built with a stable deck and an aerospace-grade frame, the Knight lll can hold up to 120kg. Not to forget, it is foldable, has a built-in kickstand and a detachable battery to boot. If your main priority is to be able to travel in comfort and style, the Mobot Knight lll is definitely the one for you. This e-scooter is built with a high-tech system and can vocally inform the rider of its Bluetooth connectivity. It comes with a powerful 48V 350W DC brushless gear motor and a battery capacity of up to 8.7Ah. Other notable functions include as previously mentioned, an built-in Bluetooth speaker, Anti-theft alarm system, USB port and more –it also make you feel good while riding it. The Mobot Knight lll is the perfect choice when it comes to function and style. The built-in Bluetooth speaker is easy to connect to your phone and it’s water-resistant too. Rain or shine, enjoy your ride with your very own music. Listening to quality music, while riding your favorite e-scooter will definitely make you feel happier and relaxed. 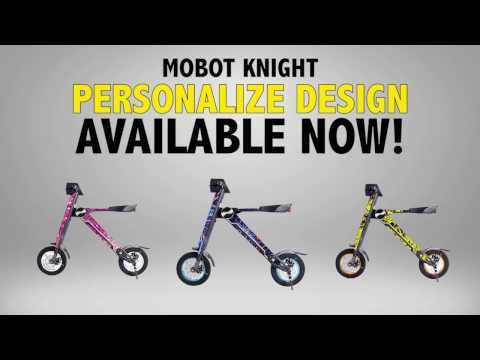 The Mobot Knight lll has a quick folding system which makes it easy to fold in seconds. With a simple flick of a switch to release the lock, you just need to pull the e-scooter up and simply carry it into the train station or shopping mall. When you need to ride the Mobot Knight lll again, just snap it back into position. You can also store it at home without it occupying too much space. There is also a USB port that can help charge your devices. This useful feature allows you to charge your mobile device, or other USB enabled devices on-the-go. The Mobot Knight lll has pneumatic rubber tires that allow for a smooth and stable ride. It can withstand vibrations, provide shock absorption and serve as added suspension over uneven or bumpy surfaces. You can go up and down slopes with a gradeability of up to 20°. An important feature of the Knight III comes in the form of a remote which acts as the key to the e-scooter. The lock button turns the e-scooter off and automatically activates the anti-theft alarm system. The alarm triggers when there is any sudden jerking of the electric scooter. There is an alert button which, on the off chance that you can’t recall where you parked it, will momentarily sound an alarm to help you find its location. Turning on an electric scooter has never been easier as the power button on the remote will turn it on offering the convenience of not having to use a key. If all these functions and features are what you’ve been looking for in a personal mobility device then there’s never been a better time than now to check out the Mobot Knight III for yourself. Check out the website for more details on the Knight III and take for a test run by visiting our showroom! Are you wasting your money buying an e-scooter insurance? Hydrogen Powered Electric Scooters – The Future of PMDs?